Wasn’t There A Pulp Game About A Jade Buddha? Or maybe a movie or book? Or maybe it was made of crystal? They would probably work best for 15mm, unless the figure has some special kryptonite-like properties that would make it highly sought after regardless of the small size. 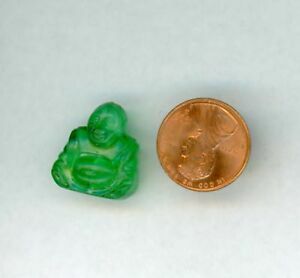 Re: Wasn’t There A Pulp Game About A Jade Buddha? Our friend Grimm, who is no very active at the moment, ran a fantastic Pulp/Back of Beyond scenario involving a green Buddha. I've played it once a real romp and feast for the eyes. I believe there is a battle report here on LAF somewhere. Nice find, by the way. Grimm was one of the most inspirational figure painters, terrain builders, and scenario creators among the early denizens of LAF. He must be busy doing something more important these days. Perhaps he is raising children? Grimm was a terrific chap. He did some custom jungle trees once for me. I asked the Prof about him a few years back and all he could tell me was that he was out of the hobby after a bad break up. He was one of the most inspirational painters and terrain builders from LAF for sure. I sure do miss him here. Anyway.....sorry to get too much off topic.